HMS Challenger was a steam-assisted Royal Navy Pearl-class corvette launched on 13 February 1858 at the Woolwich Dockyard. She was the flagship of the Australia Station Dicho 1866 and 1870. HMS Clio was a wooden 22-gun Pearl-class corvette, built at Sheerness Dockyard and launched on 28 August 1858. She was the flagship of the Australia Station between 3 September 1870 and 16 October 1873, and from 1876 was used as a school ship. HMS Niger was an 8-gun screw sloop launched on 18 November 1846 from Woolwich Dockyard. She had been intended as a sailing sloop but her design was lengthened to fit a steam engine, and she was fitted with screw propulsion at Deptford Dockyard in 1847-48 prior to completion. She was reclassified as a corvette in 1852. HMS Fawn was a Royal Navy 17-gun Cruizer-class sloop launched in 1856. She served on the Australia, North America and Pacific stations before being converted to a survey ship in 1876. She was sold and broken up in 1884. HMS Curacoa was a 31-gun Tribune-class screw frigate launched on 13 April 1854 from Pembroke Dockyard. HMS Salamander was one of the first paddle warships built for the Royal Navy. Initially classed simply as a steam vessel, she was re-classed as a second-class steam sloop when that categorisation was introduced on 31 May 1844. She was launched in 1832 from Sheerness Dockyard, took part in the Second Anglo-Burmese War and was broken up in 1883. 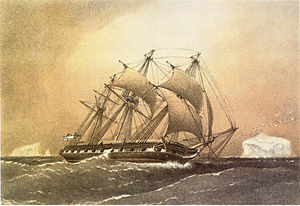 HMS Falcon was a 17-gun Royal Navy Cruizer-class sloop launched in 1854. She served in the Baltic during the Crimean War and then in North America, West Africa and Australia. She was sold for breaking in 1869. HMS Hecate was a 4-gun Hydra-class paddle sloop launched on 30 March 1839 from the Chatham Dockyard. HMS Charybdis was a 21-gun Royal Navy Pearl-class corvette launched on 1 July 1859 at Chatham Dockyard. HMS Royalist was a Satellite-class composite screw sloop of the Royal Navy, built in 1883 and hulked as a depot ship in 1900. She was renamed Colleen in 1913, transferred to the Irish Free State in 1923 and broken up in 1950. HMS Rapid was a Satellite-class composite screw sloop of the Royal Navy, built at Devonport Dockyard and launched on 21 March 1883. She was later reclassified as a corvette. HMS Tauranga was a Pearl-class cruiser of the Royal Navy. The vessel was originally named Phoenix and built by J & G Thomson, Glasgow. She was launched on 28 October 1889. Renamed on 2 April 1890, as Tauranga as part of the Auxiliary Squadron of the Australia Station. She arrived in Sydney with the squadron on 5 September 1891. During the Samoan civil war in 1899, she took part in operations with HMS Porpoise and HMS Royalist. Spending between 1901 and 1903 in reserve at Sydney before being assigned to the New Zealand division of the Australia Station. She left the Australia Station on 14 December 1904. She was sold for £8500 in July 1906 to Thomas Ward for breaking up. HMS Basilisk was a first-class paddle sloop of the Royal Navy, built at the Woolwich Dockyard and launched on 22 August 1848. HMS Barracouta was the last paddle sloop built for the Royal Navy. She was built at Pembroke Dockyard and launched in 1851. She served in the Pacific theatre of the Crimean War, in the Second Opium War and in the Anglo-Ashanti wars. She paid off for the last time in 1877 and was broken up in 1881. HMS Ringdove was a Redbreast-class gunboat of the Royal Navy, built at Devonport Dockyard and launched on 30 April 1889. HMS Cadmus was a Cadmus-class sloop of the Royal Navy. She was launched at Sheerness in 1903, spent her entire career in the Far East and was sold at Hong Kong in 1921.